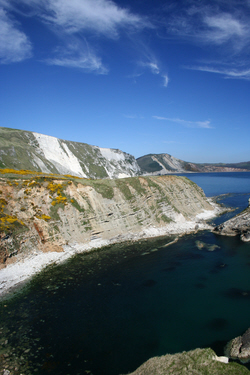 Mupe Bay is a magnificent and secluded part of the Dorset Jurassic Coast. 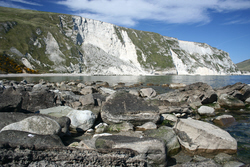 Inaccessible by car and only accessible by foot when the Lulworth Range Walks are open, this is the ideal spot for those who like their coastline wild, rugged and just a little bit dangerous! The shortest walk to get to Mupe Bay is about two miles from Lulworth Cove, so four miles there and back. If the tide is out you can walk along the beach at Lulworth and then out the other side onto the Range Walks. But if the tide is in, or the sea is rough, you’re going to have to take the high level route along the footpath around the top of the cove. This involves steep climbs and steep descents with many, many steps! On the plus side, this route affords excellent views of Lulworth Cove itself as well as wider ones to the sea and coastline. 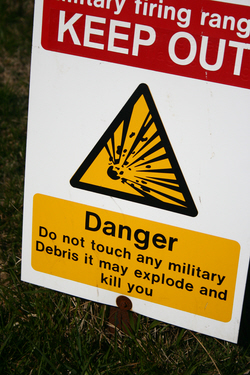 Once you’re on the Range Walks, to get to Mupe Bay from Lulworth Cove, you can either strike out across the middle of the ranges (making sure you stick to the marked path to avoid explosives!) or you can skirt around the coastline (making sure you don’t fall over the cliff!). The latter route will take you past the “Fossil Forest”, which makes an interesting and scenic diversions (more steps), before heading East to Mupe Bay. Whichever route you take, on cresting the final brow of the hill, you will be greeted by a spectacular view encompassing steep, sheer cliff faces, a bay which curves gently round to Arish Mell and Warbarrow Bay beyond. On a clear day you’ll also have views farther along the Purbeck coastline to St Aldhelm’s Head and all points in between. Although only two miles from the tourist hotspot of Lulworth Cove, Mupe Bay seems a million miles farther. There are no ice-cream shops, no massed throngs, no huge car parks, no buckets and spades and no public facilities. 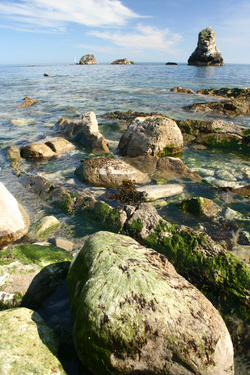 In fact, thanks to being part of the firing ranges, Mupe Bay is as close to wild wilderness as you can get in a County as popular as Dorset and a Country as populated as Britain. When it is open, people do head to Mupe Bay to enjoy its rocky beach and the sea, but you have to be fairly determined to do so on foot, given that there are easier beaches to get to for swimming and beachy type enjoyment. Although, when the ranges are open, the bay is also accessible by sea. As a circular walk the route from Lulworth Cove to Mupe is excellent exercise with some wonderful scenic views. For many that will be the extent of their enjoyment and reason enough to make the trip. Other more serious walkers will take in this section of the South West Coast Path either as part of doing the path as a whole or en route to many of the beautiful and geologically exciting bits of the Jurassic Coast also linked by the South West Coast Path. 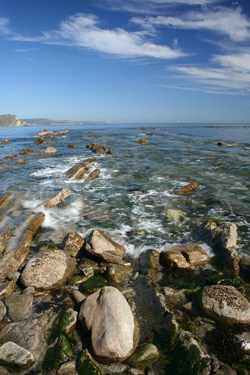 These include, Lulworth Cove, Durdle Door and Ringstead to the West and Tyneham, Brandy Bay, Kimmeridge, St Aldelm’s Head and Durlston to the East. On the plus side, the sea views, the scenery and the wildlife (watch out for Adders and lizards) are amazing. On the downside, some of the inclines are quite severe and the paths patchy, especially in bad weather. And whatever else you do, make sure you heed the warnings on any signs and that you leave yourself time to get off the ranges each evening before they close! Overnight stays are not permitted and nor is cycling on the Range Walks. All in all, a great place to visit, but check when the ranges are open before you set out. This area was also historically smuggling territory and it is perhaps no coincidence that Lulworth Castle was built with views through to the sea via Arish Mell, a small inlet of a cove off Mupe Bay itself. No doubt the view was part of the attraction, but easy access to the sea may also have played its part! 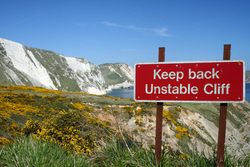 Inaccessible by car and only accessible by foot when the Lulworth Range Walks are open, this is the ideal spot for those who like their coastline wild, rugged and just a little bit dangerous! ​​"